The essence of the Grange as an organization is citizen involvement. The Grange provides opportunities for individuals and families to develop to their highest potential in order to build stronger communities and states as well as a stronger nation. We welcome persons of all races, religions, and ethnic backgrounds to use our hall and to become members. Our monthly meetings always include public educational programs that we advertise on our reader board in front of the building on Scholls Ferry Road. In addition, our local grange keeps the community connected through the events that occur here and the groups that we sponsor. Our hall is the only non-sectarian public building in the 10 mile stretch of State Highway 210 between Washington Square and Groner Elementary School -- and it is in use 5 to 6 nights a week on average. We provide the building without charge to groups that serve children in our community and sponsor their activities as well. Our Junior Grange organization promotes leadership and training in Parliamentary Procedures. The Boy Scouts we sponsor have a very high rate of young men achieving Eagle Scout status. We also rent the building to individuals and groups, primarily to dancers who appreciate our very fine hardwood floor. The rent we receive covers much of the building's maintenance expense. Our big annual fundraiser is a Turkey Dinner at which we typically serve 700-800 people. This event has taken place without fail for 55 years. Scores of people (of all ages) from the community work together to make this event not only successful, but an enjoyable and learning experience. It is a great place to re-acquaint with neighbors and old friends. 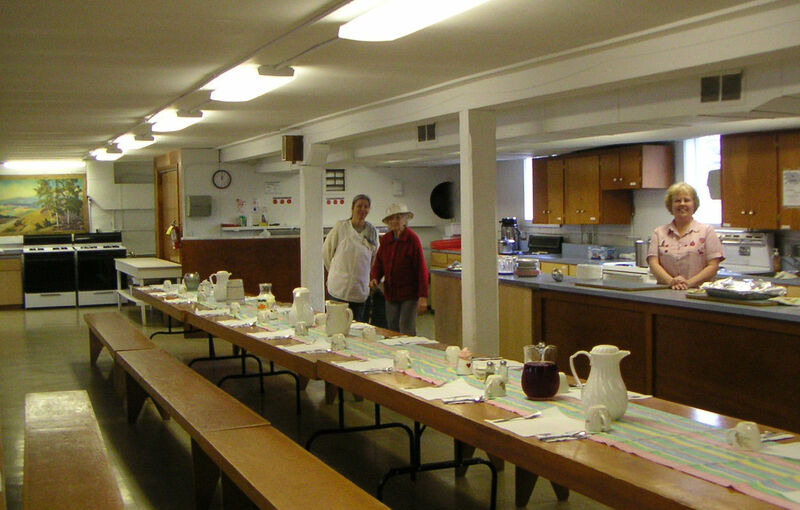 The Kinton Grange is home to many local groups and organizations. 1. Several different Square Dance clubs are our most frequent users - 2 to 3 nights per week on average. 2. A radio control airplane club - monthly. 4. Brookhaven Bazaar has Spring and Fall craft sales annually which attract hundreds of visitors to the building and community. And is Appreciated by Individuals, Families and More. 5. Individuals rent the hall for private parties (family reunions, weddings, birthday parties). 6. Individual commercial endeavors (Tupperware-type parties, dance classes). 7. Non-profits, such as OSU Extension Service Master Gardeners, who have their Spring plant sale here. 8. Other government or quasi-government groups meet here sporadically. Susie Cacciacarro, Erma Cron, and Donna Nylander in the kitchen.